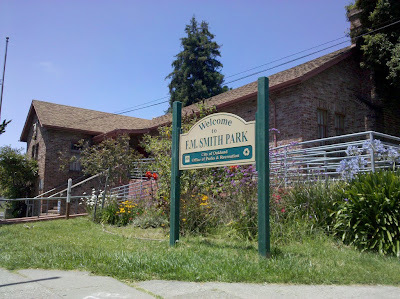 FM Smith Park, like the FM Smith Recreation Center it is also home to, is named after Francis Marion “Borax” Smith, who in 1912 had donated the land to Oakland for park use. On June 15, 1969 the former Park Blvd. Rec Center and its adjoining park were rededicated and given their current names. That afternoon’s ceremonies found playground children joining city officials and Smith family members for a program of speeches, entertainment, and the unveiling of a large playground in the form of a desert mining town, inspired by an era made famous by FM Smith in his development of the borax industry in Death Valley. This play area, complete with a 20-mule team pulling down “main street”, established an explicit visual link to Smith’s legacy. Look, mommy – there’s that place! We wanna play there! Please, pull over! No way, kids—this is East Oakland! However, ironically (as had also been the case with other examples of FM Smith’s generosity), the City of Oakland accepted and used only what suited it. Given Smith’s exemplary and lasting contributions to Oakland, the City might have set aside some funds for maintenance of the old west town; but evidently, felt that simply building it was already enough tribute (maybe they expected Smith’s descendants to pay for upkeep?). Whatever the case, as the surrounding neighborhood roughened through the 1970s and ’80’s, the play area fell into decay. 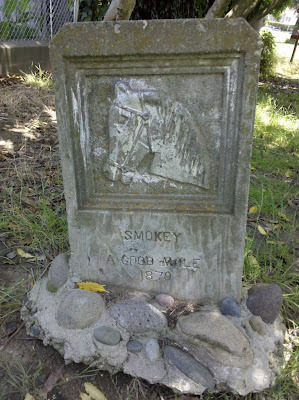 Its buildings burned or crumbled; one by one, the 20 mules succumbed to vandalism and theft. “a good playground - 1969"
photo from Our OaklandToday, no buildings survive and only a handful of mules remain – inside a cordoned-off area (off-limits to children!) – to remind certain Oaklanders that we did not entirely imagine this Brigadoon-like “park that got away” (this editor only recalls ever playing in it for a total of about 5 minutes).